Gumby and Pokey return for fun-filled adventures in this new 60s set of 40 re-mastered claymation episodes from the late 60s. These cleverly written stories engage both children and adults with enduring themes that captivate today’s audiences as they did when first released. Special features include the art film The Clay Peacock, a special behind the scenes photo gallery, the re-mastered Have a Heart animated theme song, a never before heard Gumby song and super fun clay animated bumpers. Some of the animators who worked on these episodes share their experiences and many went on to animate more than sixty iconic films including Star Wars. KIDS FIRST! Film Critic Gerry O. comments, “The Adventures of Gumby: The 60s Series Volume 2 not only contains spectacular stop motion animation, but also has fantastic and fun adventures that kids and adults of all ages can greatly enjoy.” See his full review below. Fifty years ago, before computer animation, we had hand drawn animation and stop motion animation. 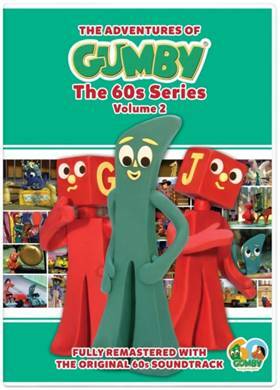 The Adventures of Gumby: The 60s Series Volume 2 not only contains spectacular stop motion animation, but also has fantastic and fun adventures that kids and adults of all ages can greatly enjoy. This series is meant to be an adventure but it doesn’t hold back on humor and will make you laugh time and again. It also has some mild action and even a slight bit of intensity, but nothing to be too concerned about. Even those intense scenes are full of light and good nature. Each episode focuses on a different story. Some may focus on an adventure into a dinosaur world or into space or even into a micro world where germs live. Each episode follows Gumby and his friends and what happens during their adventures while teaching kids some valuable information. Most episodes have some sort of moral message and, since there isn’t a continuing, viewers can watch at any point of the series and understand what is going on. I enjoy the fact that, despite most of it being pretty fantasy-like, it intertwines actual science and real-world knowledge to the point where I found myself learning stuff about economics, which was a pleasant surprise! My favorite episode is Shady Lemonade. In this one, Gumby and his friends go to a lemonade place and discover that the owner scammed them. Later that day, they save a man’s cat and the man gives them a ver y large reward. They decide to use that money so people can get lemonade at a cheap price and not worry about getting scammed. I picked this episode because, despite it not have some fun adventure, it is still a unique and fun story which kept me entertained. On top of that, the moral of the story is great – for every action there is a reaction, just like it shows in Shady Lemonade. The Adventures of Gumby: The 60s Series Volume 2 has so much to love about it. Stop motion animation is sadly a dying art and, in this series, you see what makes it so fantastic. This is an art form that has more of a human touch. In hand drawn animation, you draw pictures with pen and paper. In computer animation, you type on a keyboard. With stop motion, you physically touch the characters and alter them at will. On top of that, the voice acting is wonderful as are the songs. There is some background music in many episodes, which isn’t too noticeable but adds to the flow of the show. Despite it being over 50 years old, I still greatly enjoyed it and laughed throughout every episode. I also admire the series because its creators don’t ever talk about morals or try to explain them, but you still learn a good lesson from the fun, easy-going stories. This series is designed for kids and parents have nothing to worry about. I recommend it for ages 4 to 18. I believe adults will enjoy this show too, even though it is a kid’s show, because it sparks your imagination and its out of this world stories will make you laugh. For spectacular stop motion animation, wonderful voice acting, fantastic songs and perfect stories, I give it 5 out of 5 stars. 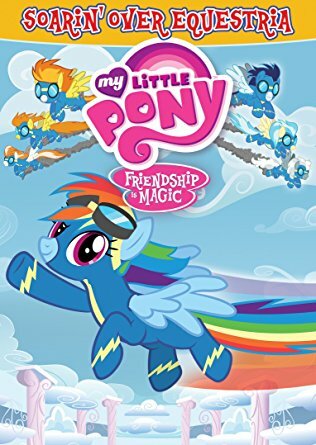 My Little Pony Friendship is Magic: Soarin’ Over Equestria offers a compilation of five episodes from the popular TV series following Rainbow Dash’s quest to join the elite team of Pegasus called Wonder Bolts. Joined by all your favorite winged Ponies, they show you Equestria the way it was meant to be seen… from above! KIDS FIRST! Film Critic Gerry O. comments, “…there have been many great episodes. Some are adventurous, some funny but always entertaining. 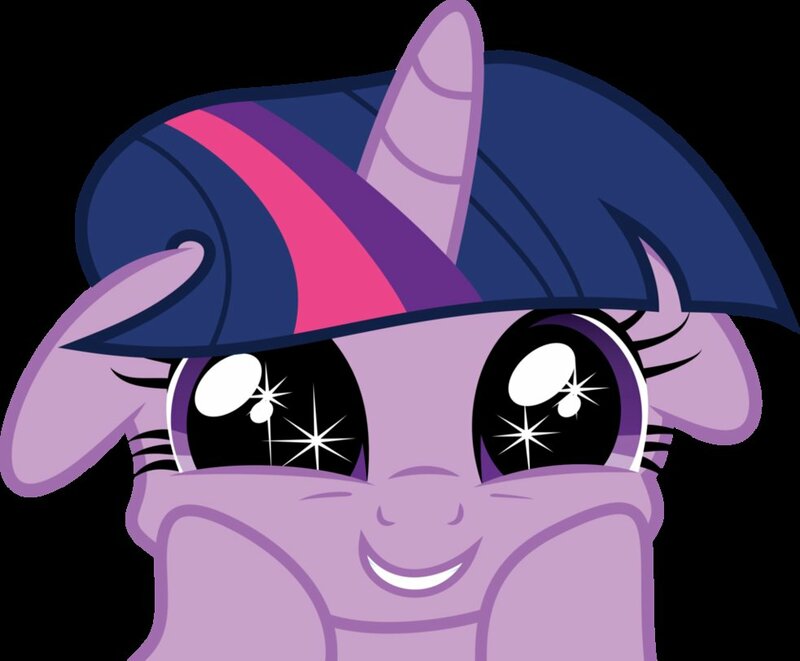 My Little Pony Friendship is Magic: Soarin’ Over Equestria has five episodes from all six seasons that truly demonstrate hilarious moments, wonderful stories and fantastic morals.” See his full review below. 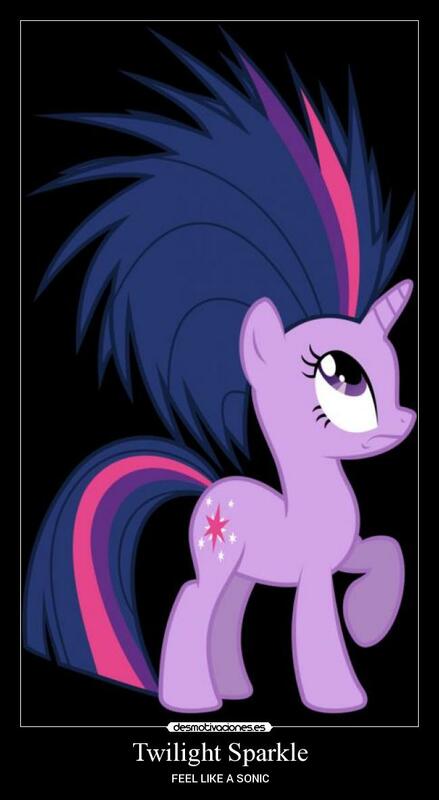 After six years of the My Little Pony: Friendship is Magic cartoons, there have been many great episodes. Some are adventurous, some funny but always entertaining. The DVD, My Little Pony Friendship is Magic: Soarin’ Over Equestria has five episodes from all six seasons that truly demonstrate hilarious moments, wonderful stories and fantastic morals. This series is mostly an adventure but there are many more elements to the show. There is very mild and child friendly drama, as well as a good amount of humor that will make audiences laugh. On top of that, there is the occasional action scene that is child friendly, but exciting. These genres are truly shown in the five episodes on this DVD. Even though all the episodes are from different seasons, they all follow the story of one of the characters, Rainbow Dash (Ashleigh Ball) trying to accomplish her dream of joining a very elite team of Pegasus, called the Wonder Bolts. There isn’t a central plot related to the main story of the show, so those who haven’t seen the show before do not have to worry about being able to follow the story. Despite there being six seasons, over 100 episodes, multiple movies and more, the show is still fresh and exciting. There are many big plot reveals in the latest seasons and it never loses its charm. This can truly be seen in these five episodes because, despite some being six years apart in release, they all still have an even level of quality, from colorful but detailed animation, to spectacular voiceover work. The DVD also comes with a sing-along bonus feature that younger kids will enjoy. The biggest part about this DVD is, of course, the morals about friendship. Each message is different, from getting over fears, to don’t make wrong assumptions or don’t fall to peer pressure. All of them are good morals that both kids and adults could learn from and are important ones that should be followed in life. My favorite episode is Testing Testing, 1, 2, 3. In this episode, Rainbow Dash needs to take a test to sign up to be part of the Wonder Bolts. The main problem is she has never really studied for anything before, so all her friends attempt to help her study in different ways. I like this episode because it talks about how everyone studies differently and the plot of this episode is a perfect example. Some people like flashcards, while others like little films about it. Another great feature about this episode is that it’s hilarious and the story has an unexpected ending. This DVD is meant for young children and I recommend it for ages 4 to 18. Younger kids may not appreciate it fully and I know plenty of older ones who are still fans. I give this DVD 5 out of 5 stars for its beautiful songs, colorful animation, emotional voice acting and complex but entertaining plots. This DVD is available now. From Warner Bros Animation comes Storks, about those eloquent birds known for delivering babies, but have moved on from delivering babies to packages. When an order for a baby appears, the best delivery stork must scramble to fix the error by delivering the baby. KIDS FIRST! Film Critic Gerry O. comments, “Storks is a film unlike most other animated comedies. Not only does it appeal to kids, with fantastic morals and fun and silly humor, it appeals to adults as well.” Morgan B. adds, “It is one of the cutest movies that I have seen this year. It has humor, an original story line, family and the cutest thing ever – babies.” See their full reviews below. The humor in this film is fantastic. Not only is it original and never gets boring, the funniest parts are when characters in the film point out something that shouldn’t be possible. That, combined with a great soundtrack and perfect voice acting, makes for very funny scenes. The animation in Storks contains a lot of bright colors as well as many beautiful scenery shots. The voice-over cast really suits their roles, even if their character has only three lines, they make the nonexistent character come to life. I love this movie so much. It is one of the cutest movies that I have seen this year. It has humor, an original story line, family and the cutest thing ever – babies. The story is unique, fun and adventurous, all of which make it a perfect family film that you will want to watch again and again. My favorite scene is when The Wolf Pack (Keegan-Michael & Jordan Peele) tr y to take an adorable little baby named Diamond Destiny to raise her as a wolf. I love this scene because it is one of the funniest scenes in the movie. The wolves actually become a submarine, boat, plane and so much more. It is humorous and silly and you can’t help but laugh along with the rest of the audience. 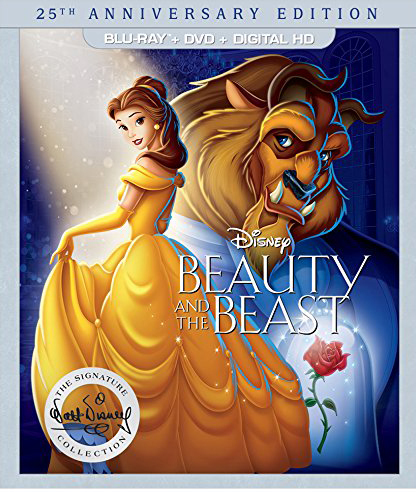 Disney’s class film, Beauty And The Beast releases its 25th Anniversary Edition September 20. 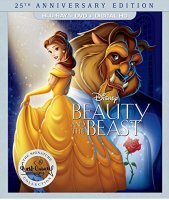 Universally acclaimed as one of Disney’s finest animated features and honored in the Walt Disney Signature Collection, the story follows brave, independent Belle on the adventure of a lifetime as she sets out to rescue her father and finds herself in the enchanted castle of a mysterious beast. This timeless tale overflows with unforgettable characters and Academy Award(R)-winning music (Best Song, Best Score, 1991)! It took more than 600 animators, artists and technicians three and a half years to complete the project. This was the first animated Disney feature scripted by a woman, Linda Woolverton and marked the first time each animator was credited on screen specifically for the character he or she brought to life. Disney’s animation department won a Scientific and Technical Academy Award for the design and development of the Computer Animated Production System used to make the film. It truly is a treasure. KIDS FIRST! Film Critic Gerry O. comments, “With its humor, spectacular animation, character design, story and adventures, this story is truly one of, if not, the best that Disney Studios’ has ever made.” See his full review below. It’s been 25 years since this wonderful Disney Animated film found its way to viewers and forever captured their hearts. Since then, there have been dozens of other animated classics, but none leave the impression that Beauty and the Beast does. With its humor, spectacular animation, character design, story and adventures, this story is truly one of, if not, the best that Disney Studios’ has ever made. It begins when Belle (Paige O’Hara), a young girl in a village, has to rescue her father from a big and scary Beast living in a dark castle. Belle then has to stay in the castle for the rest of her life to free her father. It turns out that the Beast is, in fact a prince, under a dark and magical curse. This curse makes him a horrible Beast and the only way to break it is to find a girl that will fall in love with him. The Beast and Belle start bonding and falling in love. Beauty and the Beast is an extraordinary masterpiece for many of the reasons I mentioned, but what impresses me the most is the animation. Despite its now 25 years old and way before the first computer animation, there are scenes in the film where it incorporates 3D like effects and looks almost exactly like today’s computer animation. To think that it was actually drawn by hand is spectacular and astonishing. On top of that, the voice over work is simply phenomenal, from singing to talking, each emotion and role is played ideally. Speaking of music, the songs in this animated classic are fantastically done from the beat to the lyrics, to the actual voice-over artists singing the songs, to very well-orchestrated scenes. The DVD also comes with several very cool bonus features. The most exciting to me is the sneak peak of the 2017 live action version of Beauty and the Beast with Emma Watson and Dan Stevens. It shows the cast reading lines, some special effects and even several sets. If that is not enough to spark viewers’ curiosity, there are also many facts about Beauty and the Beast as well as some footage of the actual recording booths where the original cast recorded their lines. I also enjoyed the part when it talks about how Walt Disney never really got to do this story, even though he wanted to, and thus in 1991, his creative team did it to honor his wishes. My favorite scene is when Belle goes down to eat dinner in the castle for the first time. In this castle, all the servants are magically turned into utilities. Just to name a few, there are talking clocks, teapots, knives, a stove, wardrobes, candles and more. They all do a big musical number with the classic song, “Be my Guest”, which sounds spectacular and the aniated musical number has many parts that are just hysterical. Despite some violent scenes, it is still perfect for kids. I recommend it for ages 5 to 18. Younger kids may find the Beast scary or may not enjoy the more intense scenes. I give Beauty and the Beast 5 out of 5 stars for absolutely phenomenal animation, an exciting and detailed story, beautiful songs and emotional voiceover work. Here’s to another 25 years with a new generation! 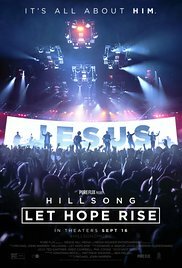 Hillsong: Let Hope Rise captures the on-stage energy and off-stage hearts of the Australia-based band Hillsong United. This film presents an entirely a new motion-picture genre: the theatrical worship experience. The film explores Hillsong’s humble beginnings and astonishing rise to prominence as an international church whose songs are sung every Sunday by more than 50 million people worldwide. KIDS FIRST! Film Critic Shelby R. comments, “Although this is a Christian band, I believe that people who are looking for healing, have different beliefs or are music lovers will appreciate the real life stories and how their music is changing the world.” See her full review below. Watching Hillsong: Let Hope Rise is the most surreal movie going experiences you will ever have. It’s not a film. It’s not a documentary. It’s a live worship experience being captured on camera. Hillsong United originated in the late 1990s in Sydney, Australia. The band itself is made up of faithful members of the Hillsong Church. This Christian band creates music that not only worships God but also instills hope to their listeners. And now, they tour many countries and continents singing songs of worship targeting the younger generation. Unlike popular concert films like One Direction: This is Us and Katy Perry: Part of Me, it is not filled with costume changes and performances. The purpose is to discuss the process of creating music that is truly meaningful. Many of their popular songs are featured in the film and have lyrics at the bottom of the screen to encourage the audience to sing along. 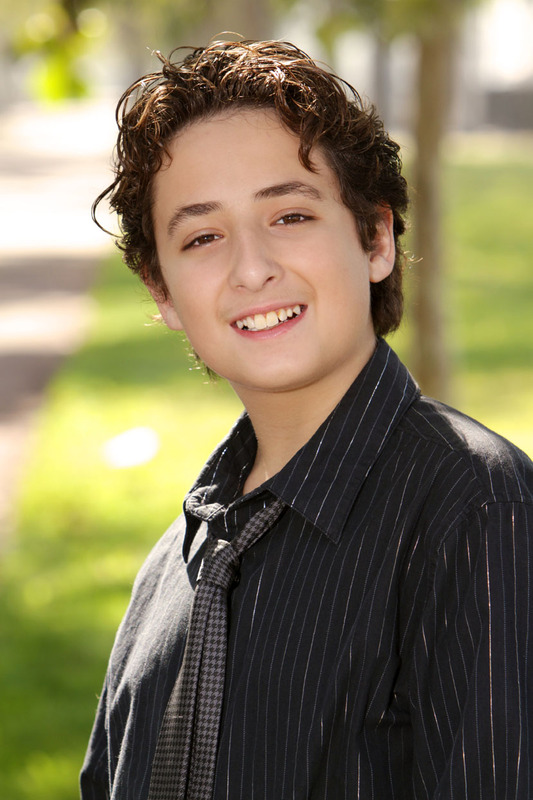 You may recognize Michael John Warren (director) from his other films like Shrek the Musical, Rent: Filmed On Broadway, Drake: Better Than Good Enough and Nicki Minaj: My Time Now. Warren digs deeper by interviewing band members, Senior Pastor Brian Houston and Bobbie Houston. Together, they share how the church has transformed their lives and why they value their music so much. “We are the biggest band that you don’t know.” Joel Houston, band leader and son of Brian Houston, explains. For almost a decade, Hillsong United has been number one and two for U.S. Christian albums sales. Joel continues to say “This film isn’t for us. The band isn’t for us. It’s for God.” The band members emphasize that the songs are carefully crafted to express their deep feeling of admiration for God. Day in and day out, the band devotes all of their time to finding the perfect sound and lyrics. One song could take months or even longer to be completely finished. That also means, months and months away from their loved ones. Music is one of the most powerful creations known to man. It is beautiful to observe these concert goers really receiving music and allowing it to affect them. I found myself shedding a few tears because it is so moving. This film is so personal and I felt like I was among the thirty thousand people at their annual conference. The most important lesson you can take away from this film is to stay true to who you are and what you believe. I recommend this to ages 12 to 18 as well as adults. Although this is a Christian band, I believe that people who are looking for healing, have different beliefs or are music lovers will appreciate the real life stories and how their music is changing the world. This film comes out Friday September 16th. Check out your local theater for listings. You are currently browsing the KIDS FIRST! News weblog archives for September, 2016.